Back in May, Exploring Mailgun: The Email Engine for Developers encouraged you to make yourself familiar with the capabilities of Mailgun, my favorite programmable email service. Then, in June, I wrote about using Mailgun's inbound mail capabilities in our startup series focus application, Meeting Planner. And of course, we've written other tutorials about Mailgun. How many of my emails are delivered successfully? How many are dropped and for what reason? How many people opened the message? How many people clicked on content within the message? 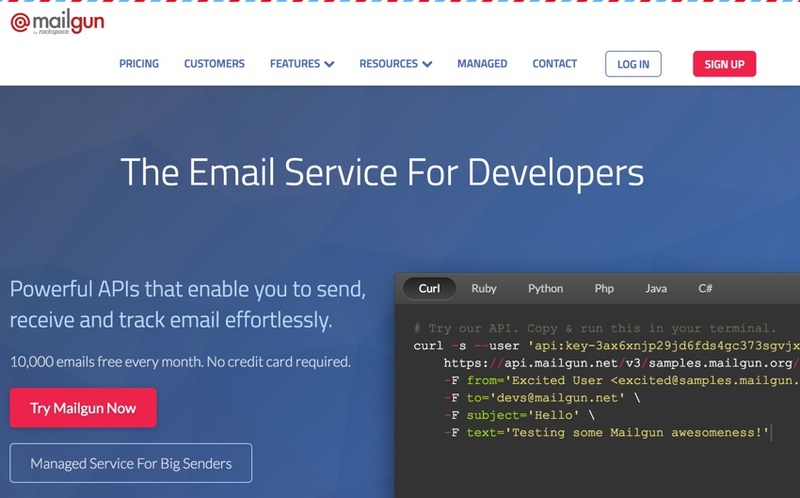 Certainly, Mailgun's powerful API is a product geared highly towards developers. But the new reporting dashboard will really make developers' lives easier by helping them quickly provide answers to the product folks—you know, those people who bug you throughout the day and whose lives depend on the impact of their email messages. While Mailgun's Tracking Events API has always allowed you to do this programmatically, the new dashboard makes it easier to see what's happening in real time—and it may be easier for less technical users to comprehend. These reporting improvements make it easier for everyone within your organization to know what needs to be done to improve your outbound email delivery effectiveness and rates of content engagement. If you want to go sign up now for Mailgun, your first 10,000 emails each month are free. Of course, feedback on today's tutorial is welcome. If you have a question or topic suggestion, please post a comment below. You can also reach me on Twitter @reifman. You can reach Mailgun via their contact page. Remind Us, What Is Mailgun? Let's dive in and explore the new reporting dashboard within Mailgun's control panel. Messages accepted by the service for delivery. In other words, the total number you asked Mailgun's API to send. The number of those actually delivered successfully (shown in green). The number of those suppressed (shown in yellow). This means that for some reason Mailgun did not try to deliver your message to these recipients. It might have received an unsubscribe request from these users, multiple complaints, or it knows something is wrong with the address or destination server. The number of dropped messages that Mailgun couldn't deliver (shown in red). The number of incoming messages (shown in blue). Below the visual bar chart, you can see a table of these numbers by date. And you can click Download CSV to get a local copy of the table in a file format usable by common spreadsheet applications. All the tables in the dashboard can now be downloaded. Let's note how helpful it is that the new reporting dashboard breaks out suppressed messages from dropped messages. This will help you assess the quality of your mailing list before you send. If there are problems, you can use the API to identify them. By clicking in the upper right on the date range, you can access a popup to change the date range. Presets are included for Last 7, Last 30, and Last 90 Days. 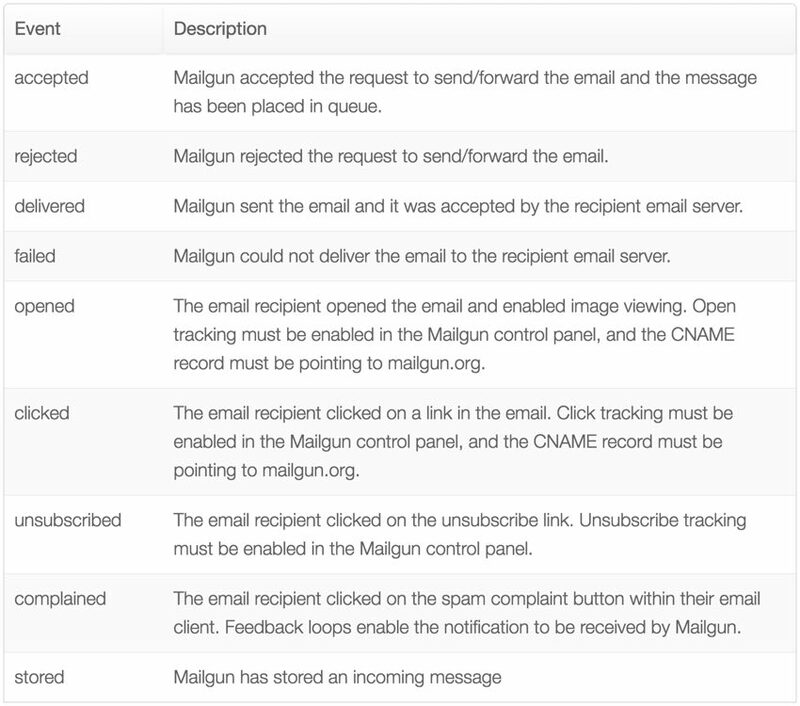 With Mailgun, you can use multiple domains to send and receive email within one account. The new reporting dashboard can visually filter by domain to separate activity between your sites and applications. Mailgun also allows you to add tags to messages to help with tracking results from specific mailings. And the new visual reporting dashboard can also filter by tag. So if you want to look at the results from a specific mailing, the tag for last-weeks-newsletter will filter activity just for a single mailing. You can also view the reports with multiple tags or across a campaign of messages. However, not all of this happens without manual configuration. Event tracking is automatically enabled, but not for Unsubscribes, Opens, and Clicks. You can enable Unsubscribes tracking for your domain via the Domains tab of the Control Panel. You can also manage unsubscribes per message by using unsubscribe variables (see Tracking Unsubscribes). You can enable Opens & Clicks tracking on two levels: per sending domain and per message. You can enable Open & Click tracking on a per-domain basis in the Tracking tab of the control panel. Note: You will also have to point CNAME records to mailgun.org for Mailgun to rewrite links and track opens. In addition, there needs to be an HTML part of the message for Mailgun to track opens (see Tracking Opens and Tracking Clicks for more detail). Mailgun's dropped chart is helpful for visually assessing your recipient database. Suppression means that Mailgun chose not to deliver a message due to past bounces (e.g. Suppressed - Bounced), unsubscribes (Suppressed - Unsubscribes), or complaints (e.g. Suppressed - Complaints). In the above chart, Bounces indicates drops from messages in that date range. I hope you enjoyed our preview of the new Mailgun reporting dashboard. It's nice to have an easy-to-use visual web interface to stand in front of the company's feature-rich API. Mailgun really offers a vast array of email services that are relevant to all kinds of coding and business development. And, impressively, they do a great job at all that they offer. Certainly this is a sponsored post, but again, as an experienced user, I offer my authentic recommendation for you to try out the service today. I've been using Mailgun for all of my projects. Please let us know which Mailgun features you'd like to see more written about in the future. You can post them in the comments below or reach me directly on Twitter @reifman.